“A Failed Attempt Teaches a Lesson” is one of the outstanding stories of the second biannual Short Story Contest 2016 written by Johann Anselm Escasa-Quesea, Brunei Darussalam. A great man once wrote, “Failing to prepare is preparing to fail.” What if you have done your best only to find out that no matter what you do, you are bound to fail? Meet Ricardo, a smart boy and diligent child who lives with his mom. He is a typical playful Year 6 student although he always thinks positively and he keeps himself motivated. He also follows his mother’s advice which is mostly about behaving well and observing proper discipline. Ricardo was aware that his mom was busy with something and he didn’t want to take her mom’s time for something he could do himself. So he politely said, “I can do it on my own, mom. I am very good at this subject!” He joked. As Ricardo reviewed his lessons, his mother felt very happy for having a responsible son. She checked on him from time to time and urged him to go to bed when it was getting late. Well, that is the trouble with Ricardo, once he set his mind into something, he becomes unstoppable! So Ricardo kept reading his notes in Social studies until it was very late and he had to start counting sheep to be able to sleep. When his mother woke him up the next day, he was excited to go to school to take the test for he was all ready for that. He had great anticipations for that day. He knew he would make his mother proud with the result of the test. Before he left for school, his mother waved him goodbye and wished him luck. 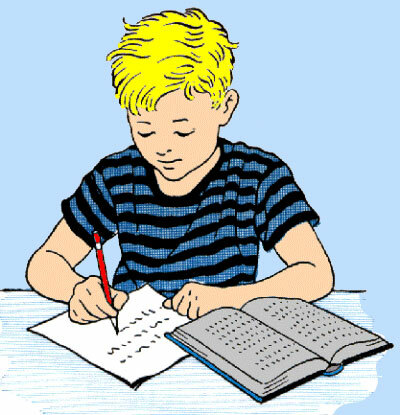 At school, he kept himself busy revising for the test and he did not pay attention to his classmates who were also studying in groups, some were busy talking about the Olympics and some were learning by themselves, too. Meanwhile, as Ricardo was sitting quietly on his chair, he suddenly fell asleep because he was up all night learning for the test. The first period started and Ricardo was woken up with the sound of the bell which rang so loudly. He looked around and was thankful that his classmates were all preoccupied with something that they did not notice him sleeping. The teacher arrived shortly and everyone prepared their stationeries. As soon as the test papers were given out, Ricardo took out his pen form his pencil box and flashed a confident smile on his face for he was sure he would get high marks in this test. But when he read the questions, Ricardo was so shocked that none of the questions was about any topics in Social Studies. It was Mathematics test paper!!! He perspired the whole hour for he could not answer the questions and only succeeded doing a quarter of the paper. He felt devastated. He knew he would eventually fail the test. When Ricardo came home, his mother gleefully asked, “How did you do in your test?” Maria was expecting a cheerful answer from him, but Ricardo did not say a single word to his mother. He went up to his room, sat on his bed and placed his hands on his face. Maria followed him and found him very upset.